If you have not yet met the mother’s caregiver, this visit may be more important than you think for both the caregiver and yourselves! Even a brief meeting helps establish you to the caregiver as an important person in the mother’s life. It also provides you with an opportunity to ask your own questions and to play a more active role. You will feel more as if you belong at the birth if you have had a chance to meet the mother’s caregiver in advance. If possible, take a tour of the hospital maternity area–birthing rooms, nursery, and postpartum rooms. At the very least, figure out your route to the hospital, how long it takes to get there, and which entrances to use during the day and at night (you usually use the main entrance during the day and the emergency entrance at night). If the mother is planning a home birth, be sure to visit the backup hospital so that you won’t be confused if a transfer to the hospital becomes necessary. Pre-registering involves obtaining, reading, and signing preadmission forms and a medical consent form. By registering in advance, you save time and avoid confusion when the mother is in labor. If necessary, rent a beeper (check the Yellow Pages under “paging systems”). If your job takes you far away, plan to have someone else available when you are not. If you have taken classes, review your handouts and notes. Gather those materials that you might want to refer to during labor–lists, suggestions, questionnaires, information about your hospital’s services. What do you pack for the hospital? What do you need for a home birth? The following lists should help. Other last-minute preparations: turn up the water heater, clean and organize the house, make the bed with fresh linens, and prepare the baby’s area. In case of transfer to a hospital, know the way to the back-up hospital, be sure your car’s gas tank is full, and include in the Birth Plan the mother’s preferences in case of transfer (see “Review the Mother’s Birth Plan,” page 20). The mother should drink at least two quarts of liquid a day–water, fruit juices, clear soups. This helps support her increased fluid needs during pregnancy. Just as an endurance athlete benefits from “carbo-loading” for a few days before an athletic event, a pregnant woman may benefit from a high-carbohydrate (high-starch) diet at the end of pregnancy in preparation for her “event”–labor. Benefits of a High-Carbohydrate Diet. A diet high in starchy foods has been shown to increase the amount of glycogen stored in muscle. During muscular exertion, the glycogen is converted to glucose, the muscle’s energy source. If the body’s glycogen stores are depleted, then fat is converted into glycogen. Fat conversion, however, does not work as well as glycogen conversion. As fat is used to provide energy, byproducts called ketone bodies accumulate in the blood, causing ketosis, a condition that can slow labor or, if the buildup is great, even cause fetal distress. If a laboring woman develops ketosis, intravenous fluids containing dextrose (sugar) may be given to provide energy and thus correct the ketosis. A high-carbohydrate diet late in pregnancy may provide enough glycogen to prevent ketosis. Foods She Should Eat. During the last few days of pregnancy, the mother should shift toward carbohydrates as her major source of calories. The following foods help build glycogen stores in muscle: bread, crackers, cereal, corn, pasta, potatoes, rice, and fresh fruit. Protein and fat should make up a smaller proportion of her diet than carbohydrates. Small amounts of milk or cheese, meat, fish, tofu, lentils, and very small amounts of butter, margarine, and oil can be added to make the starchy foods more tasty. In addition, she should not ignore fresh vegetables. A similar diet might benefit you as well; your support role in labor can also be physically demanding. In early labor, and especially in the slow-to-start labor (page 97), the mother should drink plenty of water, fruit juice, and electrolyte-balanced “athletes’ drinks” like Gatorade, ERG, and others. In addition, she should eat easily digested, high-carbohydrate, starchy foods. These can help prevent undue fatigue. 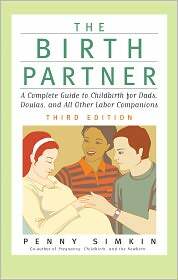 One of the important jobs of the birth partner is to time contractions. Since changes in the length, strength, and frequency of contractions are the all-important hallmarks of true, progressing labor, it is a good idea for you to (1) know how to time correctly and (2) keep a written record. Then, when you call the mother’s caregiver, you will have accurate and concrete information to provide. Use a watch or clock with a second hand. Use a written form similar to the sample “Early Labor Record,” page 45. You do not need to time every contraction. Instead, time and record four or five contractions in a row and then stop for a while (a few minutes to a few hours). Time and record another four or five contractions later when the mother thinks they have changed or if she has had some of the other signs of labor. Time the length of each contraction (in seconds), and record this time in the column headed “Duration.” Knowing when a con traction begins and ends is tricky. There are two ways: (a) the mother signals when she feels the contraction begin and end, or (b) you place your fingertips high on her uterus and begin timing when you feel the uterus become harder and rise slightly (it feels like your biceps muscle when you contract it); time the contraction until you cannot feel the hardness anymore. Sometimes the birth partner cannot feel the contractions well or can only barely feel them. The mother can usually feel them for longer, from the “inside,” than can the birth partner or even a nurse, who from the “outside” probably feels only the peak. Compare the mother’s assessments with yours; tell her caregiver if they differ significantly (for example, you might say “She feels them lasting for ninety seconds, but I can feel them for only thirty.”). When there is a large discrepancy, the other information on the “Early Labor Record” and the caregiver’s knowledge of the mother’s condition become more important in determining how labor is progressing. Figure out how frequently the contractions are coming by subtracting the time at the start of one contraction from the time at the start of the next. Record the number of minutes between contractions in the “Frequency” column. (For example, if one contraction begins at 7:32 and the next one begins at 7:45, they are thirteen minutes apart.) Do the same for each subsequent contraction. In the “Comments” column, record any other significant events; how strong the contractions seem now compared with earlier; the mother’s appetite and what she has eaten; if she is using patterned breathing (see page 85); if she has back pain or blood-tinged discharge if fluid is leaking or gushing; how she is coping. When you call her caregiver, be prepared to report the items on the “Early Labor Record.” Have it near the phone. Early in pregnancy, it seems that nine months is forever and that there is plenty of time to do everything that has to be done. It is all too easy, especially for busy people, to postpone “getting into” the pregnancy. Now, suddenly, the baby is almost due. Time has flown by. As the mother’s birth partner, you realize she is counting on you to help her through childbirth. Do you feel ready? Can you help her? What do you know about labor? Do you know what to do when? What should you do now to get ready for the baby? It is not too late to learn and do what needs to be done. But you had better start right away–a few weeks before the due date is truly the “last minute,” especially since many babies arrive early. This first chapter is basically a checklist of things you should do before labor starts, to help ensure that you will work well with the mother during the labor and birth. Also included are suggestions about how you can help prepare beforehand for the baby’s arrival. If you haven’t already done the things described in the following pages, try to get them done a few weeks before the due date, or at least before labor starts. She hits an emotional low. She is in despair, weeps, or cries out. She wants to give up or feels she cannot go on. She is very tense and cannot relax. She is in a great deal of pain. Remain calm. Your touch should be firm and confident. Your voice should remain calm and encouraging. Stay close. Stay right by her side, your face near hers. Anchor her. Hold her shoulders or her head in your hands–gently, confidently, firmly–or hold her lightly in your arms. Make eye contact. Tell her to open her eyes and look at you. Say it loudly enough for her to hear you–but calmly and kindly. Change the ritual she has been using during contractions. Suggest a different position. Try changing the breathing pattern. Breathe with her or pace her with your hand or voice. Encourage her every breath. Say “Breathe with me, . . . BREATHE WITH ME …. That’s the way … just like that …. Good…. STAY WITH IT … just like that…. LOOK AT ME …. Stay with me, Good for you…. It’s going away…. Good …. Good…. Now just rest, that was so good.” You can whisper these words or say them in a calm, encouraging tone of voice. Sometimes you have to raise your voice to get her attention. But try to keep your tone calm and confident. Repeat yourself. She may not be able to continue doing what you tell her for more than a few seconds, but that’s fine. Say the same things again and help her continue. Don’t give up on her. This is a difficult time for her. You cannot help her if you decide she cannot handle it. Acknowledge to her and to yourself that it is difficult, but remind yourselves that it is not impossible. Ask for help and reassurance. The nurse, caregiver, or another support person can help a lot–measuring dilation, giving you advice, doing some of the coaching, trying something new, even reassuring you that the mother is okay and that this is normal. Remind the mother of her baby. It may seem surprising, but women can get so caught up in labor that they do not think much about their baby. It may help her to remember why she is going through all this. Her rate of progress and how far she still has to go. How well she responds to your more active coaching. Whether she is asking for medications herself and how easily she can be talked out of them. These considerations can help you decide what to do. It is sometimes difficult to balance present wishes against prior wishes. Try to stick with what the mother wanted before labor regarding the use of medication. But if she insists on changing the plan, respect her wishes. Numerous women have said, “I never could have done it without my partner. If it hadn’t been for him [or her], I would have given up.” By using the “Take-Charge Routine,” you can indeed get the mother through those desperate moments when she feels she cannot go on; you can truly ease her burden by helping with every breath.